"It's great to win!" said Burr-Howard. 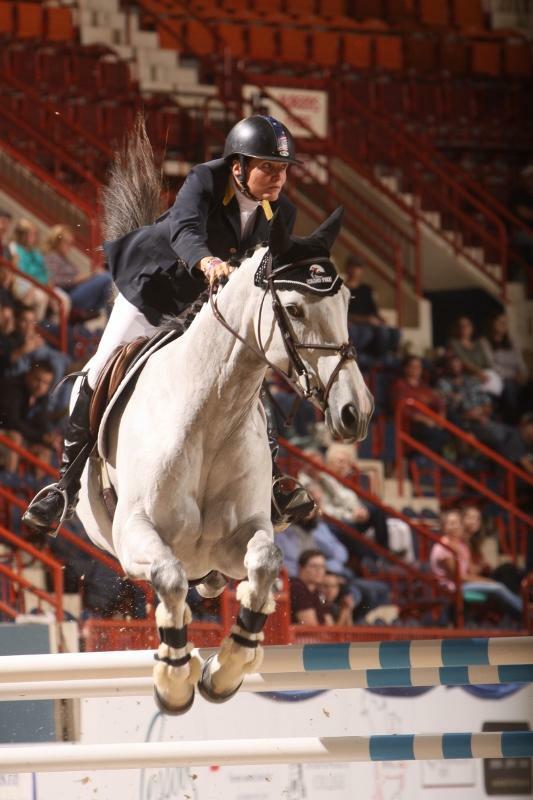 "I was a little concerned when I walked the course because this show was her first time jumping indoors and the first line was a little tricky. It was an interesting course, it had more twists and turns than I liked. My style is more of a flow. Thank goodness I had the right horse tonight. It was an excellent course for my horse, she really liked it." Coyle set the pace with the first of seven clear rounds in the field of 21 on the Bernardo Cabral-designed course. Going fourth in the order on Tienna, they crossed the timers in 50.89 seconds. For much of the class it looked like they would not be caught. Irish Olympic veteran Kevin Babington went clear on Mark Q in 54.21 seconds. Christine Mc Crea and Wannick WH went slower, but left the rails up to finish in 57.45 seconds. Coyle tried to beat himself on his other mount, Ridley, but his clear round time 53.45 seconds was not fast enough. Mario Deslauriers and Cherrypop shaved off enough time to finish in third place with a clear round score of 52.84. Ireland's Conor O' Regan and Cooper posted the slowest clear of the seven finishing on 61.84 seconds. Burr-Howard stepped into the ring late in the order and her rapid round of 50.41 thrilled the crowd, but not Coyle, who then moved down to second place. Coyle believed the starting order held the key to victory. "I think if I had been later in the order I might have been able to catch her," said Coyle. "Both of my horses jumped brilliantly, but I really wish my first horse would have had a better chance of catching Leslie. I always knew she was going to be a threat. We have been battling it out since Spruce Meadows, each of us taking turns winning, but she's gone ahead of me once too many now." Burr-Howard's impressive record earned her the Open Jumper Speed Championship. Coyle was named Reserve Champion. Burr-Howard will try to make it three for three and defend her title on Saturday in the marquee event, the $100,000 Grand Prix de Penn National. She will attempt the hat trick on Gentille Van Spieveld, owned by GJ Stable, the same horse that she won with in 2015. "I'm not going to say anything yet, because it's gone too well," said Burr-Howard. " 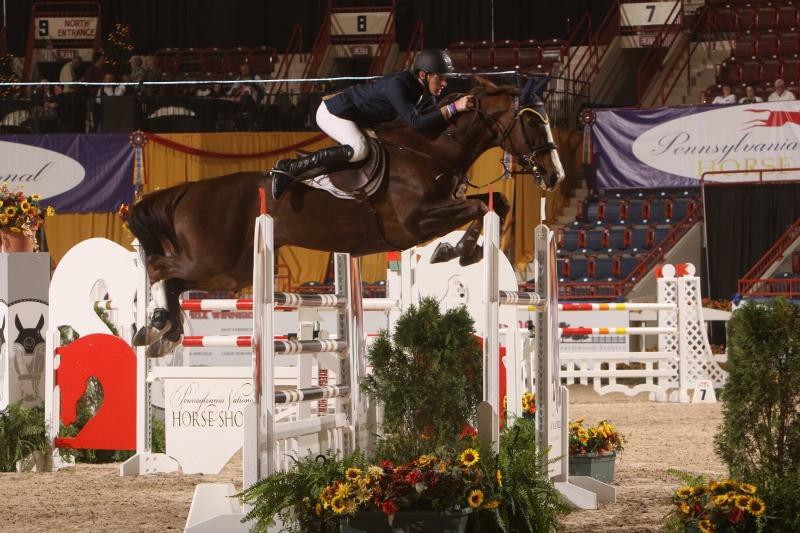 The Amateur Owner Jumper Division culminated on Friday evening with the $10,000 Show Jumping Hall of Fame Amateur Owner Jumper Classic, sponsored by the Doubleday Foundation. Callie Smith of Bernardsville, NJ, topped the four horse jump-off to win on Bigshot, owned by Smithfield Farms, LLC, in a time of 38.764 seconds. Thaisa Erwin and Deville, owned by Hollberg Equestrian, scored the only other clear round for second place with a time of 39.529. Alexa Lowe-Wiseman and Stella de Lannay, owned by Windsor Farm Sales, posted the faster of the two four-fault efforts in the jump-off to take third. Callie Seaman who rode first in the jump-off finished fourth on Dakota. 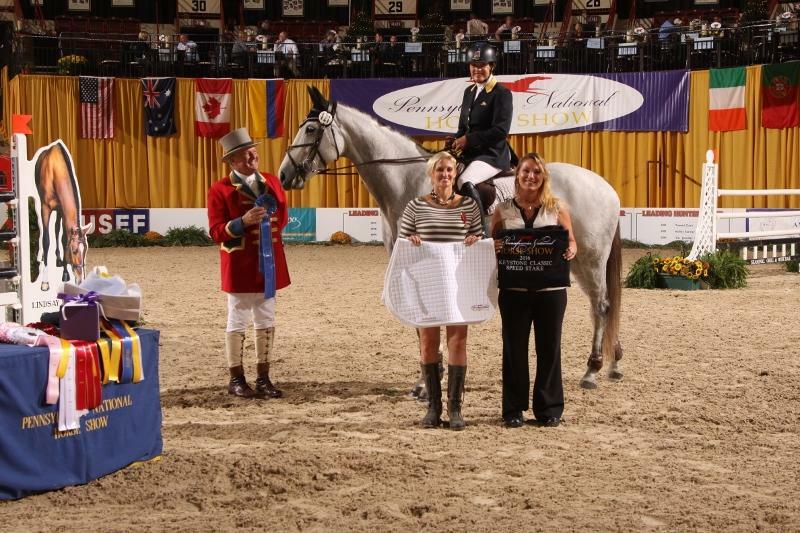 "It was really awesome to win, my goal was to jump double clear. My horse was great, he did everything that I asked of him," said Smith. 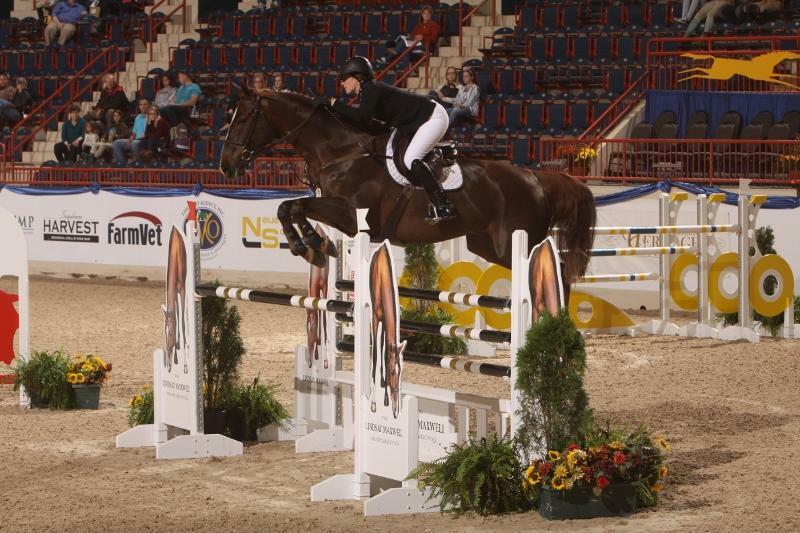 "I didn't see Callie go in the jump-off because I was schooling and then I just came over and went right in the ring. I didn't know if my time would hold up because I know Alexa goes really fast and then she had one rail down. Thaisa is my barn mate in Florida and I know she likes to go really fast, so I was really nervous about her, but fortunately she went a second slower than I did. I told her not to go fast when she went into the ring, but she never really listened to me." Alexa Lowe-Wiseman of Upperville, VA, ended up winning the Amateur Owner Jumper Leading Rider, but the day had not started off so well. "It's been a long day," said Lowe-Wiseman. "My dog, Mondo, went missing over 24 hours ago so I was home looking for him all day. When I arrived here I still thought he was lost and as I was walking down to the ring, I was told that somebody had found him. It's nice to end on such a good note. It feels great to win. Stella was amazing." 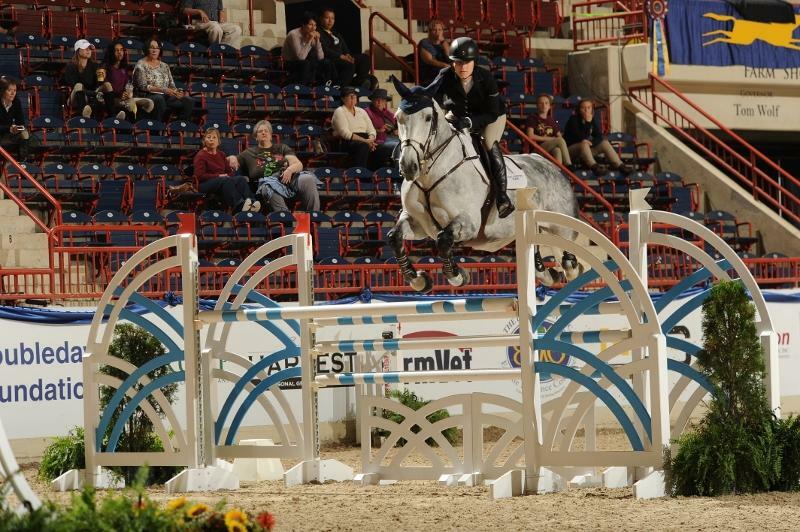 In the afternoon session, Sydney Shulman, 21, Greenwich, CT, and Toscane De L'Isle, owned by Jill Shulman, raced the top in the $3,000 Under 25 Speed Stake. Christina Firestone, Upperville, VA, was second on Arwen, owned by Mr. and Mrs. Bertram Firestone and Coco Fath, Fairfield, CT, was third on Huckleberry, owned by Hillside Farm, LLC. Five of the 12 riders steered clear in the class with each one improving on the time. Callie Smith Bernardsville, NJ, and Attention Et Z, owned by Smithfield Farms, LLC, were first on the course and the first to go clear in a time of 53.63 seconds. Canada's Cassandra Kahle posted the next clear in a time of 51.98 with Pyrenes de Louzes, owned by Redfield Farm. Fath had two entries in the class, but only rode clear with Huckleberry, her second mount, in 50.23 seconds. It looked like Firestone had the blue ribbon in her pocket blazing around the course in 47.25 seconds on Arwen, but Shulman figured out a way to finish faster on Toscane De L'Isle, clearing the fences in a speedy 45.69 seconds. "Luckily I got to go last, I think that is the best spot you can be, first or last," said Shulman. "We were watching everyone's time and everyone's turns and there were a couple of inside options. I left a stride out in the middle line and I think that sealed the deal."